Hap and Leonard is an American television drama series based on the characters Hap and Leonard, created by novelist Joe R. Lansdale and adapted from his series of novels of the same name. The series was written and developed by Nick Damici and Jim Mickle, who had previously adapted Lansdale's Cold in July and was directed by Mickle. The series premiered on the American cable network SundanceTV on March 2, 2016. So far, the series has received favorable reviews. According to various sources including Variety the series has been renewed for Season 3 on SundanceTV. The show is currently SundanceTV"?s highest-rated original series, and will return for six episodes in 2018. 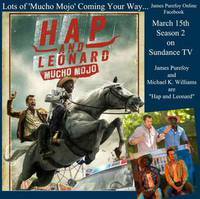 The third season of "Hap and Leonard,"? will take inspiration from "The Two-Bear Mambo,"? the third installment of Lansdale"?s book series. This webpage uses material from the Wikipedia article "Hap_and_Leonard_%28TV_series%29" and is licensed under the GNU Free Documentation License. Reality TV World is not responsible for any errors or omissions the Wikipedia article may contain.